Dr. West made his film debut in the Matrix as Councillor West, a character created especially for him. He, then appeared, in both The Matrix Reloaded and The Matrix Revolutions and also provides the voice in the video game Enter the Matrix. In addition, West provided philosophical commentary on all three Matrix films, in The Ultimate Matrix Collection, along with integral theorist Ken Wilber. A character based on West and events in his career appeared in the Law & Order: Criminal Intent episode Anti-Thesis, significant for introducing the recurring villain character Nicole Wallace, and an animation of West’s character appeared on The Boondocks “R-Kelly’s Trialâ€ episode. In May 2012, West guest-starred in the twenty-second and final episode of the sixth season of the American television comedy series 30 Rock, “What Will Happen to the Gang Next Year?” His signature scruffy beard and afro can be seen on Democracy Now!, the national, daily, independent, award-winning news program hosted by journalists Amy Goodman and Juan Gonzalez. On the musical front, West recorded a recitation of John Mellencamp’s song “Jim Crow,” for inclusion on the singer’s box set, On the Rural Route 7609, in 2009. 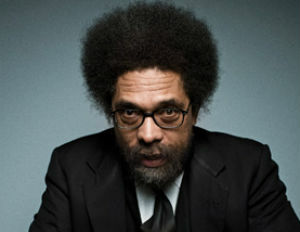 In 2010, he completed recording with the Cornel West Theory, a Hip Hop band endorsed by West. He has also released two hip-hop/soul/spoken word albums, one under “Cornel West” (entitled Street Knowledge), the other under “Cornel West & BMWMB (Black Men WhoMean Business)” entitled, Never Forget: A Journey of Revelations. His recent spoken word interludes were featured on Terence Blanchard’s, Choices (which won the Grand Prix in France for the Best Jazz Album of the year of 2009), The Cornel West Theory’s Second Rome, and Raheem DeVaughn’s, Love & War: Masterpeace. He’s collaborated on albums with Prince, Jill Scott, Talib Kweli and Nas. Barack Obama and Cornel West first crossed paths in 2004, after Obama spoke at the Democratic National Convention. In that speech, Obama called the United States of America “a magical place, a beacon of freedom and opportunity,â€ and West went on television to debate the point. The senator phoned West, and the two men talked for four hours, especially about their mutual commitment to the dreams of Dr. King. While many have criticized West for his Obama comments, especially people in the black community, we wonder how much of an effect it will have on his legacy.